HARRISBURG – The Senate Agriculture and Rural Affairs Committee unanimously approved a measure sponsored by Senator Kristin Phillips-Hill (R-York) that would provide for licensing fee exemptions for service dogs in Pennsylvania. Current law exempts dog licensing fees for dogs that are part of municipal and State Police K9 units. Senate Bill 85 expands the law to cover licensing fees for service dogs used to help individuals in need, including Seeing Eye dogs, along with dogs in service for Sheriff’s offices, fire departments, EMTs and other emergency service organizations. You can listen to Senator Phillips-Hill discuss her legislation here. 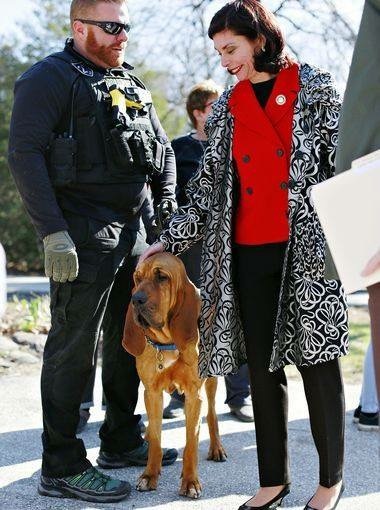 Senator Phillips-Hill with West York Borough Police Department’s K9 Detective Prince and Patrolman Scott Musselman. Phillips-Hill’s proposal would expand the service dog fee exemption to EMTs and county sheriff’s offices.